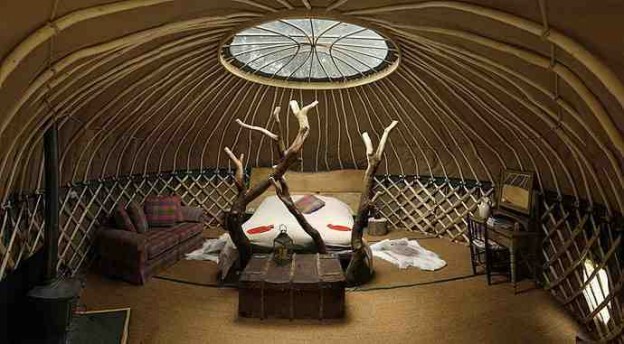 We provide a high quality, adult-only luxury glamping experience for our guests. Perfect for anyone looking for a unique, peaceful break in a hand-crafted environment set in uncrowded, quiet private woodland. 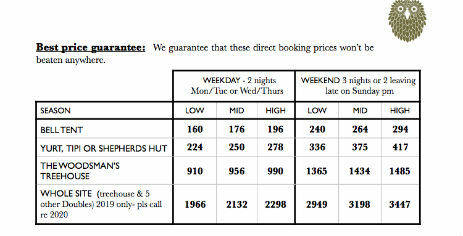 You are welcome to stay with us whether or not you are joining one of our courses. All of our accommodation features king-sized beds provided with linen, towels etc, to ensure an unforgettable – and comfortable – night’s sleep. Each tent has its own private clearing or deck, ensuring privacy and seculsion. We are always working to ensure all the site’s facilities are of similarly high quality too – from private, proper flushing loos to our famous ‘tree showers’ and from our sauna-in-a-yurt, kitchen and communal yurt. The Woodland Workshop is a beautiful private woodland area that many of our visitors have described as magical – something akin to Avatar in summer and Narnia in winter! It’s tranquil and uncrowded and very near to the Jurassic Coast ‘World Heritage Site’. We’re nestling in the glorious West Dorset countryside and just a stone’s throw from East Devon and South Somerset too. Take your pick between two yurts called Poppet and Coracle and a tipi called Hoppus, or perhaps try our shepherd’s hut – called Bodger. These yurts, tipi and shepherd’s hut each have their own private shower, washing facilities and flushing toilet. 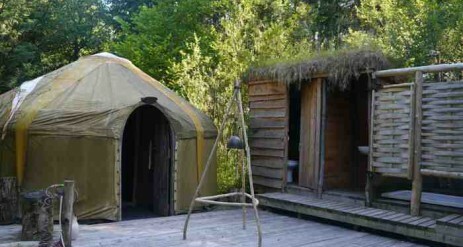 We also have a luxury bell tent. The tent has custom-made canvas flysheets to ensure the inner tent is dry whatever the weather, and each is built on a deck so they are above ground. 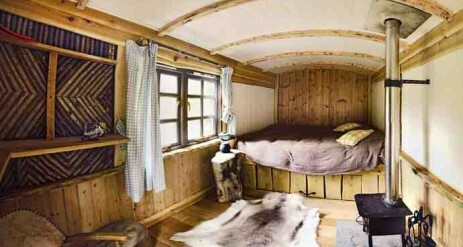 It shares a wonderful woven willow hot shower, washing and proper flushing toilet facilities (his and hers). Whichever of our accommodation you opt for, you’ll be sleeping in a king-sized bed provided with bed linen, duvets and pillows. With oak head boards, electricity sockets for charging phones etc, lighting and electric blankets – together with heated towel rails and log burners – you’ll have everything you need for a cosy stay. It will be a quiet, peaceful time too, in a child-free environment and with your own private, secluded decking or clearing. Outside each of the tents and the shepherd’s hut, there is a fire pit and BBQ, Kelly Kettle for boiling water and rustic wooden dining table with camping chairs to sit on. A Hoppus is a traditional measurement of the volume of logs prior to being converted into square sections. Hoppus is our 24ft tipi positioned in its own clearing in the woods below the pond at the end of its own boardwalk, with its own ‘proper’ flushing toilet, piping hot ‘tree shower’ and a deck. A Poppet is the head and tailstock of a pole lathe, between which the work spins. In America they are referred to as puppets. 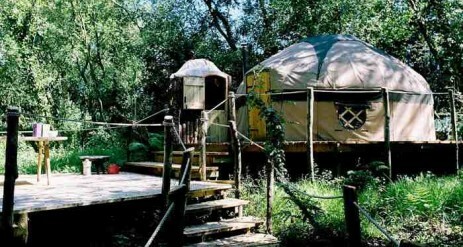 Poppet is an 18ft yurt with a king-sized bed situated in a clearing at the top of the woods above the pond. It has its own hot tree shower, flushing toilet and sink. A Coracle is a small circular or oval boat made from woven willow and hazel and traditionally covered in an outer layer of animal hide. Coracle is an 18ft yurt with a king-sized bed and oak tree shower at the end of its own boardwalk, in an elevated position in a clearing in the woods overlooking the pond. A Twybil is a T shaped gate-making and timber-framing morticing tool, with axe and chisel like blades to lever out the wood. 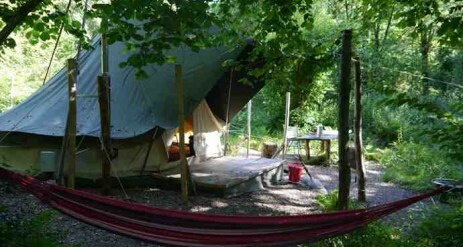 Twybil is a 5M bell tent with a king-sized bed. 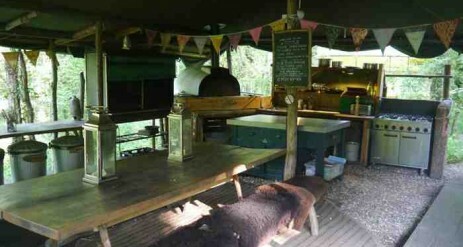 Twybil is surrounded by trees with a clearing for the oak table and brazier overlooking the pond. All our luxury bell tents are a far cry from standard off-the-shelf bell tents in a field. They are elevated off the ground on decks and have a custom-made flysheet which keeps the inner tent dry and cosy in all weather and provides a dry space to sit outside in, in the rain if you wish! use of the ‘Out of Africa’ field kitchen. This has gas rings, an oven, hot water and a washing-up sink, a hand-washing sink, cold mains-fed drinking water, cutlery, crockery, tea cups and glasses and cooking utensils and recycling, compost and landfill dustbins. use of a freezer for cold packs, and shared use of the field kitchen refrigerator. use of a central communal yurt, which has sofas, a fire and a range of games, a library of green woodworking and craft books and a library of craft DVDs, along with local information (and our shop). we supply biodegradable washing up liquid, soap, shampoo and conditioner. If you would prefer to use your own please make sure that it is biodegradable. campers can help themselves to complimentary Dorset Cereals – the perfect start to a day in the woods (please bring your own milk). there is also a supply of free complimentary Dorset teas, infusions and coffee. All you really need to bring are clothes, a toothbrush, food supplies and your toiletries. The Woodsman’s Treehouse is a totally private and unique experience set high up in the branches of a veteran oak. The ultimate retreat. A stylish combination of sustainable craftsmanship and luxurious interiors with a playful touch; highlights include your own sauna and hot tub on the upper deck, a revolving woodburner, an open air tree-shower and a stainless steel slide. All our courses are project based and designed to be fun, relaxing and informative. They are suitable for men and women, complete novices and experienced woodworkers or crafts-people alike, whether you are keen to discover more about a particular skill or simply want a relaxing break away from it all. Our approach to offering courses means we can fit in with our guests’ schedules much more freely, and restrict group numbers so the teacher-pupil ratio is never more than 4:1. You are free to book any day for a course if the date is available and you’re coming along with someone. (Two people is the minimum, four is the maximum.) Alternatively, you can make an individual booking on courses already in our diary that have free spaces.